Many years after first reading the classic 1930s novel, Sarah Lawson decided to open the book again and write down her second impressions: Emma Lee considers that this re-appraisal was well worthwhile. Margaret Mitchell’s Gone with the Wind was published in 1936 to a muted critical reception – it was regarded as a “woman’s book” and those who hadn’t read it accused it of being full of Southern clichés. Its reception wasn’t helped by the book being turned into a popular film shortly after publication, which meant Mitchell’s characters, Scarlett O’Hara and Rhett Butler, became forever intertwined with the actors Vivien Leigh and Clark Gable. Fifty years after first reading the book as a teenager, Sarah Lawson re-read it and shares her impression in 14 essays (one for each day of the fortnight), curious as to whether the distance of time and geography – Lawson moved from Indiana to the UK in 1969 – had changed her views. The first essay, ‘The Overture’ starts at the beginning, discussing the opening chapters which cover a lot of ground whilst teasing the reader by keeping the main characters apart. Readers learn about Scarlett’s parents’ marriage, the structure of society in Georgia, of Scarlett’s desire to be desired, how the neighbours see her, the impending Civil War, how people’s motivations are disguised by behaviour and how all this is conveyed in the natural flow of a story without what we might now call “info dumps”. Further essays discuss technique and craft, narrative strategies, dialogue, dialect, play-acting and characterisation with separate essays looking at feminism and race. Margaret Mitchell learnt her craft from journalism and interviews – the way she describes Rhett Butler is not unlike her descriptions of Rudolph Valentino, whom she interviewed. The essays explore key scenes through different aspects and critical threads. This is perfectly valid if the essays were published as stand- alone pieces, but it got a bit repetitive when reading the essays collectively. That’s not to say the arguments were not valid, but a most selective use of quotes and references from the original book might have been applied. For those familiar with the novel, there are no surprises in the essays closest to the novel itself. The essays confirm Margaret Mitchell knew how to tell a story, that her pacing and plotting were authentic and that she created some of the most memorable characters in fiction. Scarlett O’Hara naturally gets the most attention as she grows from indulged teenager whose future should have been an advantageous marriage and management of a household and slaves. This future is interrupted by the Civil War and she finds herself burdened with responsibility and forced to negotiate her way in a collapsing social order with people who are also traumatised and bereaved. Despite her belief that she should only look forward, she still clings to the false belief she loves Ashley Wilkes, an atypical Southern gentleman. He’s sensitive, swept up into a war he doesn’t want to fight and returns broken, unable to fall back into his expected role as plantation owner and master. Scarlett O’Hara is a flawed heroine though, not just through her initial naivety, but her willingness to rashly marry twice, (once on the rebound hoping to make Ashley jealous and once for money to save her family’s plantation) and also for her lack of maternal instincts and her failure to recognise love when she has it. One essay discusses whether Melanie Wilkes is the actual heroine. Melanie is married to her cousin and, despite Scarlett’s belief otherwise, it appears to be a love match. She too is capable of fortitude when required. She quickly provides a reason for the gunshot and reassures others in the household to cover up Scarlett’s killing of a Yankee soldier in self-defence and later play-acts to save her husband’s life when Yankees accuse Ashley of being at a Klan meeting, the punishment for which would be a lynching. Unlike Scarlett, Melanie manages to keep seeing the best in people, works to bring and keep people together and maintains the appearance of being a Southern Belle. However, she has nothing to offer when they face losing Scarlett’s family plantation to taxes. Although she too has faced the same changes as Scarlett, she is more focused on clinging to social mores and so rejected as an alternative heroine. The essays that move outside the immediacy of the novel look at feminism and race. Discussion of feminism centres on Scarlett and her conversion from pampered belle to a decisive woman who takes control of her situation. Completely against social expectations at the time, Scarlett takes on the running of her second husband’s sawmills, even though this is eventually handed over to Ashley. Like the other white women in the novel, Scarlett is forced to reject the ideals and future her mother raised her to expect, and instead to rely on her inner strength, educate herself and negotiate her way in a rapidly changing landscape that would have been alien to her mother. Margaret Mitchell’s key theme is change and Scarlett and her peers mature from being idly wealthy to having to do manual labour and to manage money. The female slaves don’t see much change. They choose to stay and continue working much as before, albeit with a willingness to point out they are free to leave if asked to do something they don’t agree with. However, the novel ends before the effects of emancipation are really felt and understood, and the novel’s focus is on the immediate after effects of the Civil War. Sarah Lawson makes the point that any novel set in the 1860s has to be historically accurate and Margaret Mitchell’s concern was authenticity, therefore the novel can’t avoid slavery. The point is made in the opening pages that the O’Haras are kind to their slaves – Gerald is thanked for buying both mother and daughter from a neighbour – but they don’t challenge the use of slaves. On returning from the war and discovering his family’s planation abandoned, Ashley Wilkes comments that he would have given the slaves their freedom anyway, but it’s left for the reader to decide whether he is genuine or trying to save face. The slaves too had a hierarchy. House slaves regarded themselves as being of a higher status than field slaves and house slaves often felt that the status and respectability of their household reflected on them. This is offered as sufficient explanation for why the O’Hara’s household slaves stay but the Wilkes’ slaves desert. Their characters are not stereotyped. Mammy, the elderly ladies’ maid, with her bulk and her waddle, seems close to a caricature but she has a distinctive voice and her own logic and mind. She’s not above chastising Scarlett either and it’s Mammy who goes to Melanie to ask her to persuade Rhett Butler to accept Bonnie’s death, showing she understands the dynamics of the people she serves. Giving her characters hindsight and a twentieth century attitude towards slavery would damage the integrity of the novel. Novels are not sociological surveys. Sarah Lawson’s style is engaging, clearly argued and persuasive. Her conclusion points towards the book as being worth re-reading and re-considering, which may seem as if it confirms her bias towards the book. However, her in-depth look at key scenes and occasional comparison with the film, which was necessarily abbreviated, supports her argument. She discusses how the film and reputation have prevented Gone with the Wind being critically studied and given its due place in the literary canon. 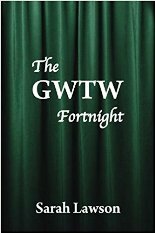 Overall The GWTW Fortnight is a compelling re-evaluation of a much-loved book that deserves a better critical reputation. A Spoonful of Sherman, Zedel, London. Review by Barbara Lewis. The Mystery of Dunkirk, by Jane McChrystal.